The Times of Oman this week has been quite vocal on the 2 year ban, first running this story that bosses should be more generous giving NOC's and then running this story stating that the OCCI chairman, Mr Said bin Saleh Al Kayoumi, stating that the two year ban is good and protects business' interests. Well, at least it's fair journalism, showing two sides to the coin. Getting back to the Chairman of the OCCI (Oman Chamber of Commerce & Industry) article, he is quoted as stating: “there are more pros to the decision than the cons” and that the ban “protects employers from the greed of employees”. And on the face of it, he has a point. If I were to accept a job here, move to the country and then find out that I can do the same job at another company and get a higher salary, or better living conditions, or even a better posting (eg posted to Muscat as opposed to Hafeet) then yes - of course I'd change my job. Given that an employer incurs costs to employ someone and bring them to Oman, then yes that's a somewhat sound argument. The argument that people can't move jobs because they "come to know trade secrets and know-how" is quite frankly ridiculous. That's called experience and is why people are paid more to do a job when they have more experience. It's why a graduate gets paid less than a person with 25 years experience! 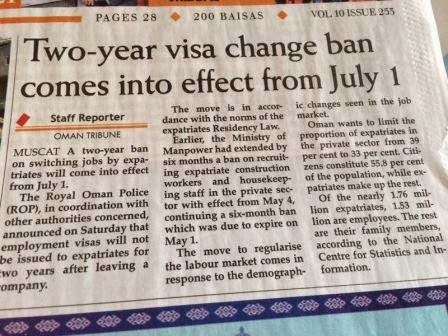 I actually support the 2 year ban in the sense that new-comers to Oman, who have signed a contract with an employer should not just jump ship and change jobs because they found a better deal once they got here. That's their fault for not researching and negotiating for a better package. My argument with this 2 year ban enforcement is that once people have completed their contract with their employer, why can't they change their job? What hold does an employer have over an employee once their contractual obligations are concluded (eg, two years service are completed)? 1. Remain with the company - negotiate better terms or stay they same, the Oman labour law rewards people who stay with the same employer for more than 3 years by doubling their gratuitiy entitlements. 2. Leave the country for another country - be it returning home, or going to another expatriate role elsewhere, or retirement. 3. Change jobs in the local market. Let's say you came to Oman, you got your job and were told that your accommodation would be (for example) a villa and that you would have a car. Let's say that you get here and you're given a small apartment and are told you have to to catch the company bus. Let's say you persevere with this and complete your contract, but in your two years you've developed a network of contacts, one of which is offering you a job to come and work with them, and they're offering you much better living conditions and a higher salary. Now why can you not change jobs? What hold does an employer have over you that should prevent your free movement to change your employer? It seems that the good chairman thinks that employers own employees ad-infinitum, outside of a contractual term. Oh, if you don't like it, of course you can leave! And walk away from your industry and geography specific experience which you could trade on to better your personal status. I cannot understand how this law "protects its people and the economy" of Oman. What is being enforced is that expatriates with local knowledge and experience are faced with two choices; stay where you are or leave the country. This treats expatriates as inanimate objects, good for only one job and no capacity to improve or develop over time. In some industries, I'd understand that logic - there's not much skill required to work in a fast food kitchen. But what about the skilled workers? What about the carpenter with 20 years experience that want's to change workshops, or the consultant with 10 years local experience who doesn't like their company and wants to change companies to work on different projects? If an engineer with 15 years experience in Oman wants to change jobs to a new company because they've been offered a management position there, how is not allowing that person to move protecting the people of Oman or it's economy? That new company won't be able to hire the local knowledge and expertise it needs, and thus might not decide to open up in this country, and therefore a number of jobs that would have been created are not. This 2 year ban rule needs to be amended, the expat brain drain has begun already and it will continue to do so unless this rule is reviewed. My suggestion is to lock people in to their contracts, but once their contracts are completed, allow employees to move freely because refusing to allow them to exerts control over a fellow human being outside of an agreed to employment contract. Preventing a suitably qualified worker from taking a job simply because they had previously worked for another employer (and fulfilled their contractual obligations) gives unfair power to an employer over an employee. My argument here is very simple: What rights does an employer have over an employee once it's contract has been fulfilled? Why is the employer allowed to infringe the rights of an employee outside of their contractual relationship? Agreed, a completed contract should be the point at which all obligations end with perhaps covenant established at the onset to be adhered to, not that unusual in some industries. Where an employee takes on a contract but the employer fails to meet it in an appropriate manner and an external agency such as MOM determines this to be the case, the requirement for the NOC should become null and void, clearly the employer at fault (and likely bearing a grudge too) is not going to give it despite being the guilty party. YES! If a skilled worker LEAVES Oman to go to UAE (for example) - Oman looses. Simple as that. The contract should be completed.. after that let the worked decide - OR, they will decide to leave to better themselves. Expats who like Oman are of value to Oman. - new people may leave unexpectedly and cost companies money. The rule is only protecting companies by giving its staff no options.. not helping Oman as a whole by letting it's skilled workers have options inside the country. I am one of those affected by the ban. I have been working in Oman for almost 10 years, I am very specialised in my field in which I hold a Masters degree. The company I was working for last could not quite handle me being more qualified than the boss himself and dismissed me from one day to the other - without reason and obviously without pay! I have now been in court for almost 8 months against them, to get my money and to get an NOC. I have another company who are only waiting to process my visa, yet they can´t because I don´t have the NOC. I am now leaving Oman, as I am simply not interested in working in a country that makes it so difficult for an individual to employ their skills, work ethic and energy. If they don´t lift this ban, Oman will experience a severe "expat brain drain" - Oman, with a number of recent developments and decisions, is currently moving backwards and not forwards. And what about those of us that were made redundant after a company collapse? We STILL need NOC's and are unable to move to the replacement company, affecting and delaying a MAJOR infrastructure project. All because the failed company refuses to issues NOC's. Funny how MoM promised to make this a non-issue for a select few of us....and then did nothing. Reap what you sow, Oman. It’s very simple, if you are not happy then leave and don’t come back. There is always someone else ready to come and replace you. greedy expats can cross the border and they will find their haven. "It’s very simple, if you are not happy then leave and don’t come back. There is always someone else ready to come and replace you. greedy expats can cross the border and they will find their haven." Words from a generation of lazy national who reaps benefit from all the help the good government is giving to nationals. Start working hard and from the lowest position and grow in a field then I would accept your hateful comment. That’s what Omanisation has given to Oman. What has Omanisation brought to Oman, nothing. We Expat have to lower our standards to that of the Omani staff. Mess up our English. I go baden come. Long time no see. I go to Bray. School transportation is in a mess, delivery of cooking gas, water, food stuff is not happening on time. The productivity has gone down from everyone. But still the top guy in OCCI says that there is no effect on the Oman economy. Nothing will change, because no one cares for the Expat or for that matter the Omani population, like all over the World who wants to make money is making money. A sad fact is that Omani nationals do not understand that they reap the benefits of expats' higher skills or cheaper labour. All the excess value goes to their pockets. All gaps in productivity and efficiency among the local population are closed by cheaper or more experienced expat labour. All the surplus value created this way goes to the Omani economy (local businessmen and their families, cheaper prices of products and services, new local jobs created by skilled expat professionals etc). Without expats all that surplus value in consumption, employment etc would simply disappear (until Omanis themselves pick up the pace but that takes time). If local businessmen could find equally qualified locals at a competitive price, they would have done exactly that. But this somehow doesn't go into the heads of the most of the locals for some reason. Expats here are not charity cases nor slaves. They come here because you need them and they cannot be treated as commodity. Otherwise they will go away and leave you without skills or without that extra cash their cheap labour had saved you. Even though i do not have this problem with the NOC, I am getting increasingly tired of being treated as a second class citizen. Therefore I am getting ready to leave. The NOC and the two year ban law has simply been implemented in Oman because the badu minds can't come up with a way to limit the growth of Expatriate workers in Oman. By implementing a barbaric slave running type of law, the Ministry of Manpower could not think outside of the box but think in a very old fashioned and promitive way! I personally think all these types of laws are to protect the incompetent Omani youth from developing complexes at work and also restrict the growth of expatriates from becoming professionally successful and financially wealthy. Well said Freddie. Atlast someone got the guts to talk about the drawbacks of 2 years ban. I feel the rule is like, I passed graduation with first class and I am forced to remain in graduation class itself. Not allowing to take post graduation. This has to be changed. Everyone has to get freedom to take their own choices. I am true victim of 2 year ban. I was working with unprofessional Omani management company and the pay was very less. I wanted to change the company and continue to work in oman itself because i love the country and I was not allowed due the 2 years of ban. So I simply resigned from the job and getting ready to go to UAE for another good job. This rule has to amended. Otherwise I think people like will leave the country and oman will run out proffesionals. It’s very simple, if you are not happy then leave and don’t come back. There is always someone else ready to come and replace you. greedy expats can cross the border and they will find their haven." hahaha ... "haven"? Have you lived anywhere else? Apart from the weather and tax free status, Oman is pretty crap. Lethal drivers, limited activity options, censored cinemas, censored press (well, more than most), limited pork, limited alcohol, limited employment prospects, crap internet speeds, censored internet, serious food hygiene issues, expensive rent, monopolistic markets (so expensive products) .... I can go on. Have you ever wondered why we get paid so much? It's because most of us wouldn't come to Oman if we weren't! So when an expat moves to another company in Oman he/she takes the company secrets with them. What about Omanis how come they can change jobs every other day? I think they should be applying the NOC on Omanis before expats because they quit their job after the company spends 1000's training them for 2 Riyals extra! They don't have any loyalty or respect for their own companies or country. The sad thing is, at least at my work, they CAN find skilled Omanis to replace expats, but maybe the thing is, they don't want to give Omanis their rights? Maybe because these rights are too many or too much and do not protect the employer? The new law doesn't help with skilled labour however. It should protect the contract term ONLY not anything after that. Anonymous October 14, 2015 at 10:54 AM: Many expats come to Oman for more than money. People who come here just for money, were likely NOT skilled enough for UAE, or thought Oman was nicer than say Kuwait or Saudi. Says a gal who was the child of expat oil company peeps....Oman isn't perfect but what you are saying is what makes idiots like the "go to another haven" kind of commentator sound like they ARE right about expats. Expats aren't all the same and Omanis aren't either. When they announced this regulation chance, and call it “to regulate the labour market”, it shocked me. Labour is best working, on a supply and demand capitalist basis. Same as cars, or any other commodity, you choose what to buy and pay for it. Capitalistic, autocratic and communistic combined. An employee sell his labour to the best bidder!! Had a disagreement with owner, gave me notice, 11 Months in court to get money legally due to me, no NOC, dictatorship? Changing rules in middle of a game, soccer, rugby or any other, is a big NO. If I knew about this law, I might not have signed up. I was brought here due to qualifications and 25 years of experience. Pick up difference with top management. They then become the police, judge and king in every contestant way, or pack your bags and go, or subject yourself to it. Request that companies must be more lenient with NOCs, show me one. Though I love the country, but some labour practices are utterly wrong, an Omani, a sweeper of floors (earn), actually get, 3 times that of a qualified hardworking Bangladeshi person in same company. This is slavery to me, but enlighten the fact that of supply and demand. If a company looking for a Civil engineer, and receive 100 000 good applications, just guess what they will pay the one these employees. Supply and demand??? Have you ever wondered why we get paid so much? It's because most of us wouldn't come to Oman if we weren't!" And you are still here even though "Oman is pretty crap". Do not worry Omanisation will send you back to the perfect life you had before coming to Oman. I am one among those affected by the ban , I was working in a company for 7 years , and the management(Expats) played a dirty game to put another expat using the provisions of the ban , who is their long time friend and using the provisions of the ban they ensured that I dont join any other company by not providing me a NOC. I gave up fighting because I realised they are no worth my time and class. Simple I was against the corruption and all malpractices with in the organisation and they wanted to evict me to protect their self interest and their chairs .This rule and more, I blame it on many expats too , who tried to make their extra money through malpractices , corruption , kickbacks etc other than what they agree as salary or what is been documented . Shame on you guys , you are been paid for your need and skills or for your qualification , if it was not your greed many countries like Oman could have been a second or better home for you . Unfortunately its the innocent who is getting affected . Having said the truth , My advice to all Omanis , you need to exhibit more maturity to see your country at its best.All the Best.